Nothing before on this scale in maritime shipbuilding had been constructed by the Romans, enigmatic and confounding was their discovery, that their purpose to this day is still a subject of speculation. From the size of the ships, it was long held that they were pleasure barges, though, as the lake was sacred, no ship could sail on it under Roman law (Pliny the Younger, Litterae VIII-20) implying a religious exemption. Discovered in the volcanic lake of Lake Nemi in the Lazio region of Italy, the two vessels had long been known by local fishermen, but were first discovered in 1446 by Cardinal Prospero Colonna and Leon Battista Alberti. The depth of the wrecks at this time made them too deep for salvage (18.3 metres) and attempts at their recovery by Colonna and Alberti only led to significant damage to the preserved timber. In 1895, with the support of the Ministry of Education, Eliseo Borghi began a systematic study of the wreck site and discovered the site contained two wrecks instead of the one expected, these were named Prima nave & Seconda nave. In 1927, the Italian dictator Benito Mussolini ordered the engineer Guido Ucelli to drain the lake and recover the ships with the help of his armed forces and regime contacts. 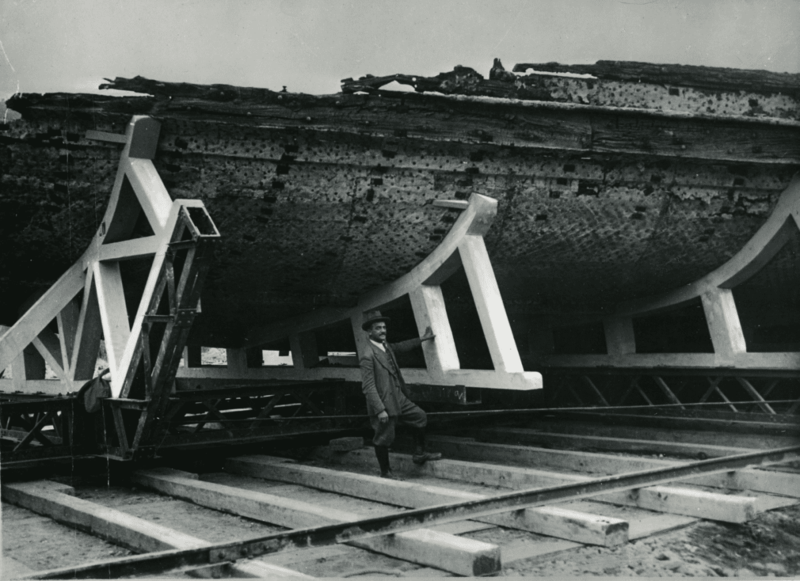 The full process of recovery was fraught with calamity, from mud eruptions to subsidence in the lake floor that meant the ships weren’t fully recovered until 1932. The first ship recovered was 70 meters (230 ft) long with a beam (width) of 20 meters (66 ft). The hull was divided into three “active” or main sections. The general shape of the hull appears wider at the stern and narrower at the bow. The superstructures appear to have been made of two main blocks of two buildings each, connected by stairs and corridors, built on raised parts of the deck at either end. 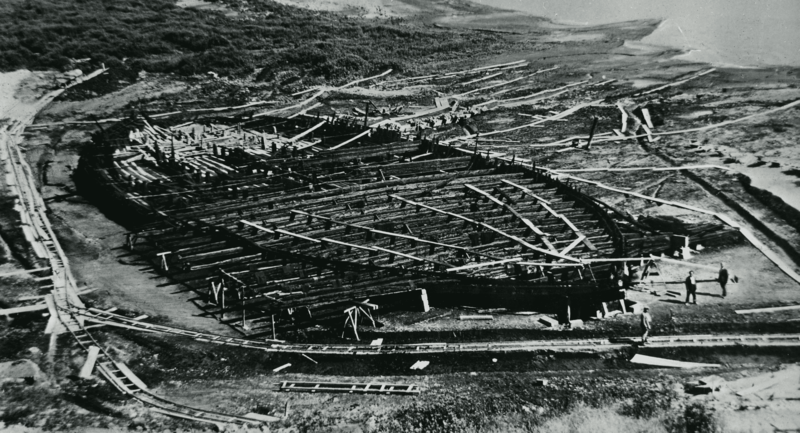 This distribution gives the ship a discontinuous look and has no similarity to any other ancient construction. The second ship recovered was the larger at 73 meters (240 ft) in length and with a beam of 24 meters (79 ft). The superstructure appears to have been made with a main section amidships, a heavy building at the stern and a smaller one at the prow. 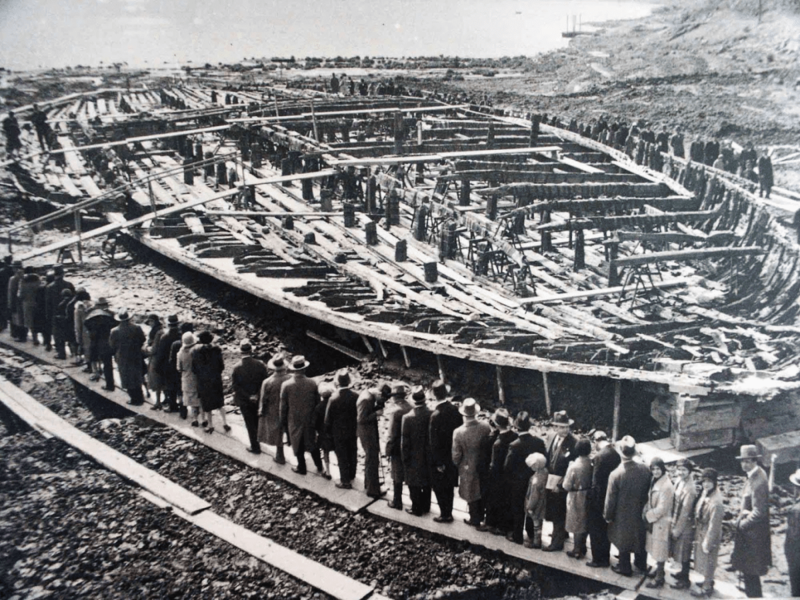 Seconda Nave contained elaborate quantities of marble, mosaic floors, heating and plumbing. Both vessels were constructed using the Vitruvian method, a shell first building technique used by the Romans. They were steered using 11.3 meters (37 ft) long quarter oars, with the seconda nave equipped with four, two off each quarter and two from the shoulders while the prima nave was equipped with two. A lead pipe found on one of the wrecks had Property of Gaius Caesar Augustus Germanicus (Caligula) stamped on it while many tiles had dates of manufacture. Seutonius describes two ships built by Caligula; “…ten banks of oars…the poops of which blazed with jewels…they were filled with ample baths, galleries, and saloons, and supplied with a great variety of vines and fruit trees.” A year after their launch, the Nemi ships were stripped of precious objects, ballasted and then intentionally sunk following the assassination of Caligula.